The design of my son's nursery was inspired by my baby's grandfather's polo shirts. However, ontrary to what you might have thought; this was not a sports theme nursery decorating project. In fact, the room doesn't have a theme, the room's color scheme and decor was chosen according to a specific color scheme. Check out more of our baby boy's nursery pictures. A modern blend of geometric designs that were chosen to complement a crib quilt made of fabric from the old shirts. A crib quilt made of fabrics with special meaning is an excellent and creative way to keep precious memories close. 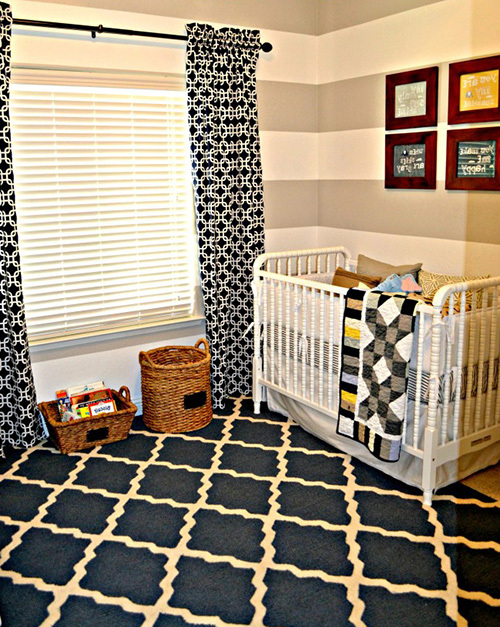 The homemade crib quilt in the picture is the inspiration for Ethan's nursery design. The room is, as you can see, "All Boy". Not only does a patchwork quilt made of shirts bring them out of the closet where they can be enjoyed; it's a conversation piece! I can picture mom and dad snuggled together wrapped in the quilt sharing stories with Ethan about his grandfather. One of the first questions that Ethan's mom, Shannon, asked Mandy, The Project Queen, was whether she had ever painted horizontal wall stripes. I would never have dreamed that this was Mandy's first rodeo from the beautiful results. PLUS, she has promised a tutorial on the painting process. There is yet another reason to visit her blog! Shannon chose a grey, khaki, yellow and navy blue nursery color scheme based on the colors included in Ethan's crib quilt. 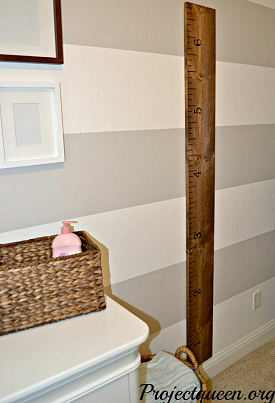 A growth chart, a giant version of a vintage wooden ruler, contributed a touch of natural wood to her baby boy's nursery décor. 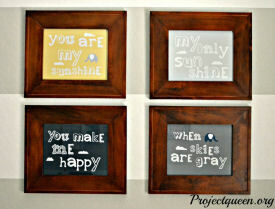 The wooden frames that frame lyrics of "You Are My Sunshine" reflect the finish of the baby growth chart. The group of art prints make a lovely arrangement on the wall behind Ethan's crib. Any decorator will tell you that a successful project depends on attention to the tiniest of details. 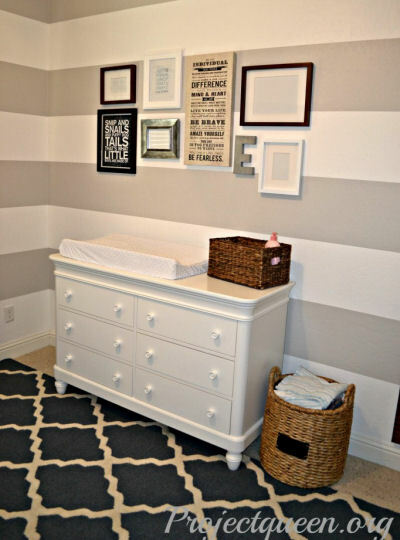 The Latchy Catchy on the door that reflects the gray and white stripes of the nursery walls is a perfect example of this rule. For those of you that are unfamiliar with this handy little device; you simply attach it to the door knob to prevent a "click" that might wake a sleeping baby when the door is opened or closed. BRILLIANT and beautiful! Thanks to Shannon for allowing Unique Baby Gear Ideas's visitors to enjoy the pictures her baby boy's nursery and congratulations to Mandy on yet another beautiful decorating project; she truly is The Project Queen! 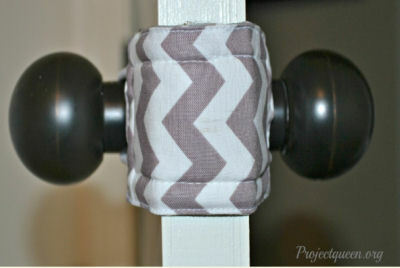 I love your decorating ideas and I am going to make a latch cover for the nursery door today! Why do people collect football shirts, of all things to use for decorating? I guess that every football enthusiast has saved more than a few shirts so I guess it is not such a bad idea but certainly unusual. We are going to do something similar to the polo shirt idea only we are going to use t-shirts with logos of baseball and softball teams that we played on when we were kids. Wish us luck! If things go as planned we will be back to share pictures of the nursery. Join in and write your own page! It's easy to do. How? Simply click here to return to SPORTS THEME NURSERY PICTURES and DECORATING IDEAS.